Garrett is either a relative of Brian Danielson's or part of the friends of the families, as he shows up at the wedding in "I Don't" as a chaperone for Quinn. 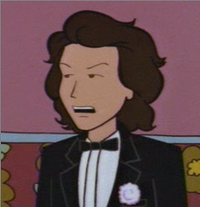 He may or may not be related to Luhrman, who he noted was hitting it off with Daria. He was immediately smitten, telling Quinn "you're just about the loveliest thing I ever saw." ("Thanks.") When she was away from the reception, he tracked her down to where she'd been cornered by the wedding's priest and his speech about "love". A clearly aware Garrett implied he knew what was really going on - "With all due respect, Father, I wonder if maybe you're not the one with the confusing emotions" - which led to a violent fistfight. Garrett lost and was consoled by Quinn after. In "Love is a Way Too Many Splendored Thing", Quinn writes: "A really sweet guy, especially when he punched that minister in the eye." This page was last edited on 8 April 2018, at 09:58.